This weekend I went on a bit of a cooking spree. I used my shiny new red Kitchenaid mixer and made strawberry muffins. Made chili. Cheese dip. And then Sunday night, my man and I made a wonderful dinner. First, I roasted a chicken. 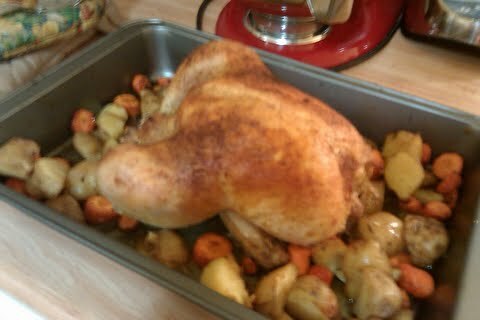 Julia Child says in her “Mastering the Art of French Cooking” that a restaurant could be judged by how good their roast chicken is. Mine, I must say, was pretty spectacular. If you’ve never tried to roast a chicken before, I highly recommend it. First of all, it isn’t complicated, it just takes some time in the oven. Secondly, your house will smell soooo good! And lastly, it is really pretty and will impress you and any guests. Here is how I roasted this marvel. First, I cut up a couple of small potatoes and a 4 carrots and tossed them into the roasting pan with olive oil, salt, and pepper. Simple. Once all that prep is finished, pull out your chicken (making sure that there aren’t parts packed inside. If there are, toss them). This next bit is the only hard part. Carefully slide your fingers under the skin of the chicken. You can reach in through the front of the breast. Try to not tear the skin. The idea is to pull the skin off the meat over as much of the chicken as possible so that you can stick seasoning in there. Once the skin is loosened, work the remaining garlic in there and then rub some of the butter mixture under the skin as well. Once that is done, toss the chicken in your pan with the veggies. Then generously coat the outside with the butter mixture and sprinkle more seasoning on top. Bake at 350 for at least an hour. Baste every 20 minutes or so with the butter mixture. This will give it a beautiful brown coating and helps make the skin extra crisp. Cooking times vary depending on how big your bird is. Wait until the top is nicely browned and the drumstick moves easily in the joint. Or use a meat thermometer. That’s the easiest. And check it out! A beautiful bird. And the potatoes were so crisp and tasty from being in all that butter and chicken fat. Yum. And then there was chard. I recently had chard at a fabulous restaurant and loved it. I’d never tried cooking it before, but every time I talked to someone about it they were like, “Oh, it’s easy. Just cook it with butter and bacon til it is wilted.” Seemed easy enough, so I bought a big bunch of the chard this week to try it out. My darling man made the chard and I think it might be my new favorite vegetable. Or maybe bacon and butter is my new favorite vegetable. Either way, the chard he made was absolutely killer. I want to eat it every night. And not only was it super tasty, but it was beautiful. So colorful and lovely. We ate the roast chicken on top of a bed of the chard and I thought I was in heaven. First, chop 4 pieces of pancetta. Toss them in a skillet with 1/4 stick of butter and cook until bacon is cooked and butter is nice and melty. 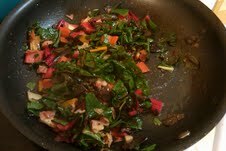 Toss in a bunch (as in 6 large leafy pieces in our case) of chopped rainbow chard. Cook until chard becomes soft and smells like heaven. Season with salt and pepper as needed and serve. Don’t let it sit in a hot pan after it is finished or it will get too soft. This was a wonderful dinner. It may have had something to do with the copious amounts of butter, but I think it was our mad kitchen cooking skills and these awesome recipes. If you haven’t tried chard before, go check it out. Do it now. I’ll be eating it all fall. Hello there, I discovered your blog by way of Google even as searching for a comparable subject, your web site got here up, it seems to be good. I have bookmarked it in my google bookmarks. I simply desired to say thanks once again. I’m not certain the things that I would’ve made to happen without those techniques revealed by you directly on that subject matter. This has been a real daunting matter in my view, but being able to view the very specialized mode you managed it made me to leap for fulfillment. I am happier for this service and then wish you comprehend what a powerful job that you are undertaking teaching people with the aid of a web site. Most likely you haven’t encountered all of us. Thanks for another informative website. The place else could I get that kind of information written in such an ideal approach? I’ve a venture that I’m just now working on, and I’ve been at the look out for such information. Thank you for another excellent article. Where else may anybody get that type of information in such an ideal approach of writing? I’ve a presentation next week, and I am on the search for such info.